Almost all pomegranates grown in the United States are one variety: Wonderful. John Chater, a Ph.D. student at the University of California, Riverside, wants to change that. He would like to broaden the varieties of pomegranates available so that someone going to a supermarket can, like apples, buy varieties of pomegranates that vary in sweetness, seed hardness, flavor profile and color. With that in mind, he has spent the last four years researching the commercial potential of 13 pomegranate varieties, and also started breeding new types of pomegranates. He has field trials set up in Riverside and Somis, just east of Ventura, so he can evaluate the difference between coastal and inland climates. He has also chemically analyzed the juice of the varieties for quality. 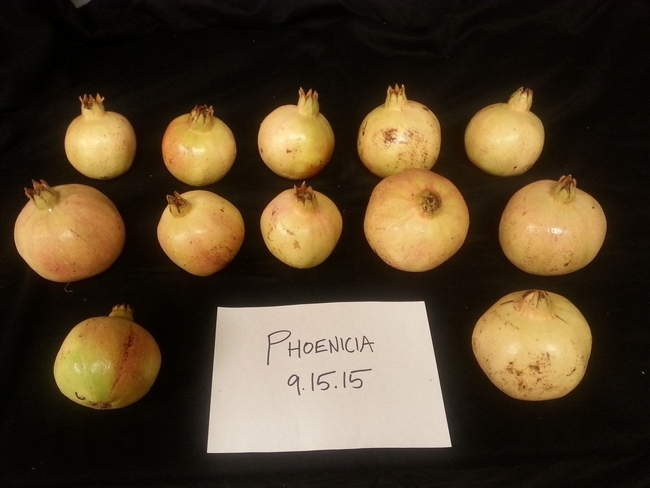 Preliminarily, Chater, who is a 2016 University of California Global Food Initiative student fellow, has identified seven pomegranate varieties that have commercial juice potential. Three of them – Blaze, Phoenicia, and Purple Heart – were developed by his grandfather, who was a mechanic at a hospital but developed a cult following among fruit growers in California for developing new varieties of pomegranates. Al Sirin Nar: Large fruit, with hard seeds, soft peel, and large arils. With its sweet-tart juice, it could be useful for juice applications. Seeds may be too hard to be sold as a whole fruit. 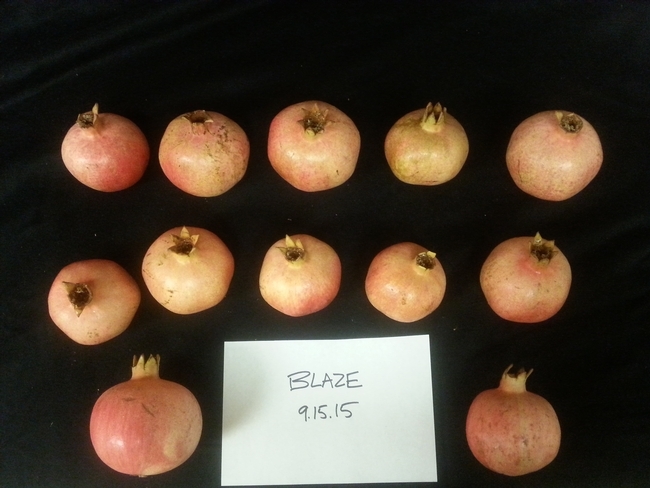 Blaze: Medium sized fruit, juice more sweet than tart. Fruit similar to Wonderful. Could serve coastal and inland growers. Has potential to be sold as a whole fruit. 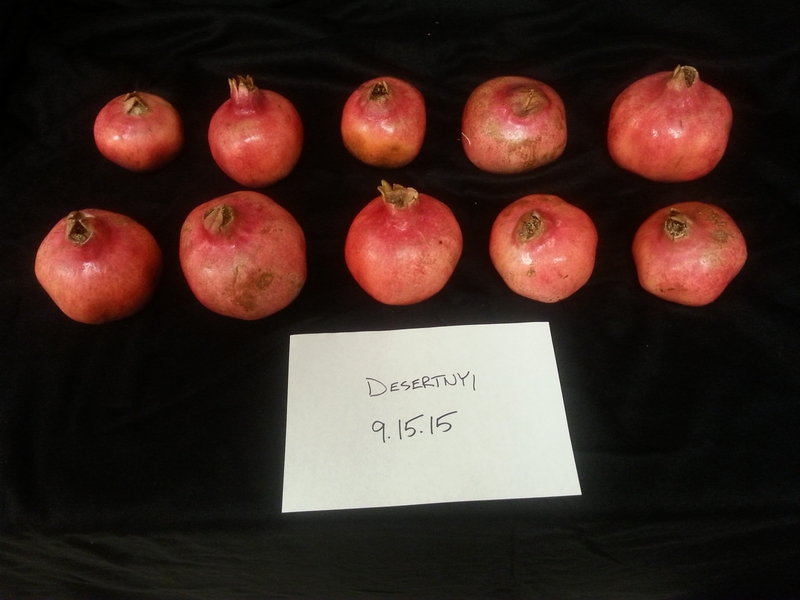 Desertnyi: Soft-seeded, medium sized fruit with ornamental quality. Delicious balanced flavor that has been described as citrus-like. Trees seem to may need trellis or rootstocks for commercial production. Has potential to be sold as a whole fruit. 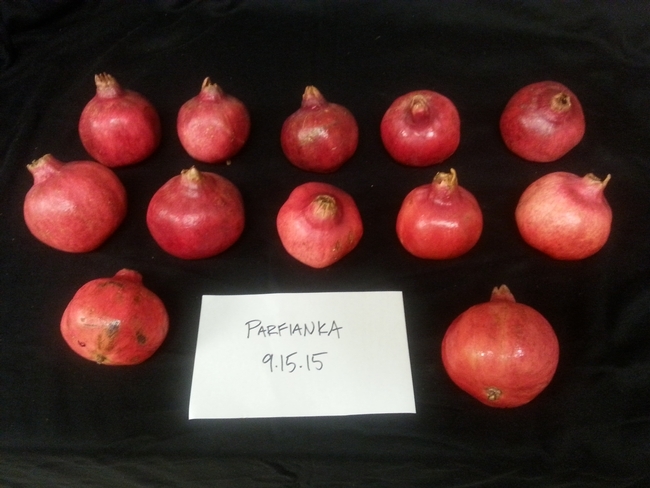 Parfianka: Soft seeded variety with sweet-tart to sweet flavor. Very precocious in the field and on both inland and on the coast. This variety is an international favorite for its refreshing flavor and soft seeds. Has potential to be sold as a whole fruit. Phoenicia: Large fruit with medium to hard seeds. Fruit multicolored with yellow, pink, and reds. Sweet-tart flavor with a tartness that consumers enjoy. Fruit seems to keep well in storage. Purple Heart: Medium-sized red fruit that has dark red juice and arils. Fruit and juice similar to ‘Wonderful'. Sold as ‘Sharp Velvet' at Dave Wilson Nursery. 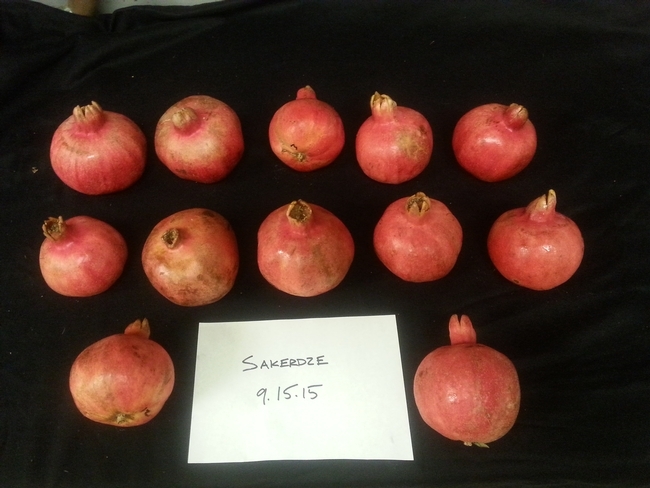 Sakerdze: Large fruit, with hard seeds, soft peel, and large arils. Juice is sweet to sweet tart. Fruit can be pinkish to red. I am a locally grown produce distributor located in Los Angeles. I am interested in bringing different and unique varieties of pomegranates to market. Feel free to contact me to discuss ways we can work together. Thank you. Getting to good sugar without cracking is important. If these are all fully mature fruit, then that is encouraging. We are avid gardeners and live in the bay area(east bay hills). We have many fruit trees in our backyard including 4 pomegranates, - wonderful, Eversweet, Parfianka & sweet. We have had wonderful for a few years and haven't tried the others yet as they are still young. Parfianka is flowering right now and can't wait to try the fruit this fall. Hoping we would get atleast a few from Eversweet & Sweet next year. As always looking to try new varieties, where can we buy Phoenicia and other varieties. I am forming an orchard of varieties of pomegranate of several places, if somebody has like to supply some seeds of varieties. 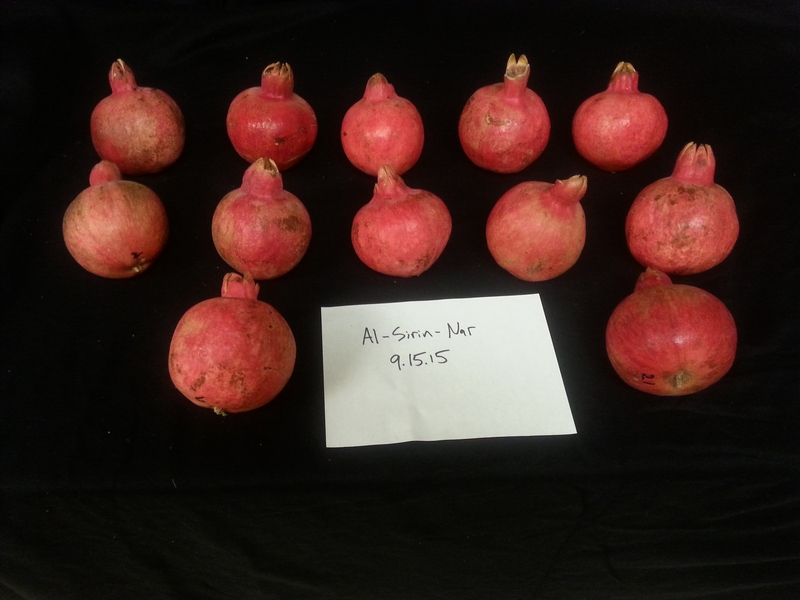 I am also looking for varieties of pomegranate azerbaijin, turbekistan, babylon, syrian, Sakerdze, Phenicia. I have a farm at coastal Georgia, zone 9. I am looking for some soft aril pomegranate to our farm. PLEASE let me know if you have these soft aril varieties to share. Thank you! 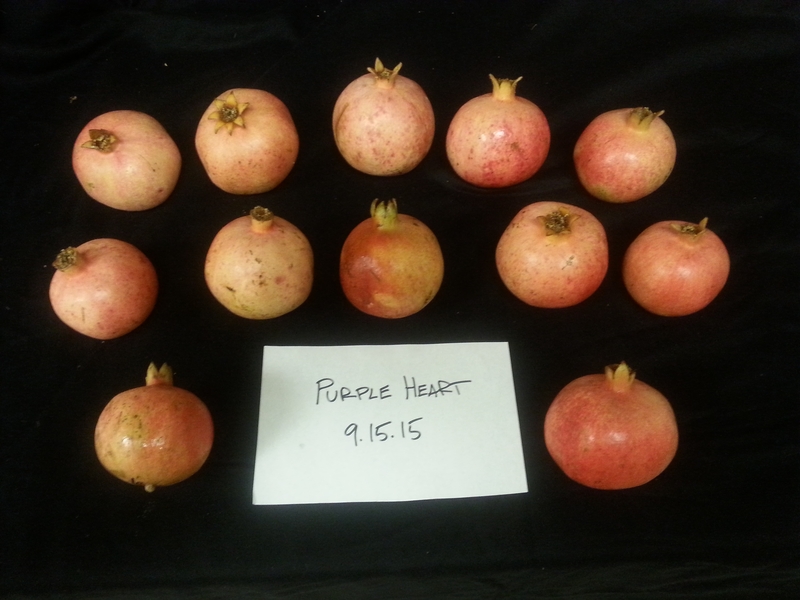 I have a unknown Variety of Pomegranate that doesn't ripen until late October and usually not until November. The original tree is growing in Pomona, Ca. but where my husbands Aunt and Uncle got it from is unknown since they are not living to ask them. I think it might be Sharp Velvet, but I am not sure. The fruit is a dark red with a garnet red flesh. If anyone would like cuttings I am cutting it well back this year and I am attending the CRFG meeting at the LA Arboretum on Saturday, Feb 2 and will be taking some cuttings.